The Typhoon Simulator machine is a two seat, motion theatre that transforms any gaming space or arcade location into a high return attraction, which now comes with a 4 movie upgrade kit! The Typhoon Simulator comes with a total of 6 fun and exciting movies that will appeal to players of all ages! Whether they are being immersed into a fantasy world, roller coaster ride, or experiencing an authentic high-speed car race, players will thoroughly enjoy this unique experience! Players sit side-by-side and are immersed into the movie using various dimensional effects such as motion, wind, and more. The simulator can mimic up to 2G’s of acceleration and can enact 400 movements per second! You can now upgrade your Typhoon Simulator with an extra 4 movies, making a new total of 10! Players will love the new experiences and added options to this already high earning machine! These movies are made especially for the Typhoon Simulator, with dozens of 3D artists, animation specialists, gameplay veterans, film directors, and all around creative specialists, working in-house to develop original content, adapt branded content, or to develop exclusive content for operators. This makes the Typhoon Simulator experience is a unique one! 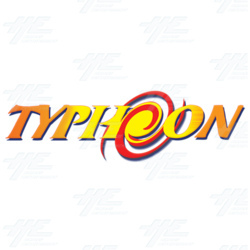 The Typhoon Simulator comes with a total of 6 fun and exciting movies that will appeal to players of all ages! Whether they are being immersed into a fantasy world, roller coaster ride, or experiencing an authentic high-speed car race, players will thoroughly enjoy this unique experience! Players sit side-by-side and are immersed into the movie using various dimensional effects such as motion, wind, and more. The simulator can mimic up to 2G’s of acceleration and can enact 400 movements per second! You can now upgrade your Typhoon Simulator with an extra 4 movies, making a new total of 10! Players will love the new experiences and added options to this already high earning machine! These movies are made especially for the Typhoon Simulator, with dozens of 3D artists, animation specialists, gameplay veterans, film directors, and all around creative specialists, working in-house to develop original content, adapt branded content, or to develop exclusive content for operators. This makes the Typhoon Simulator experience is a unique one!